Samuel L. Jackson has been campaigning for years now for Lucasfilm to bring back Mace Windu to the Star Wars universe. The Jedi met his fate at the hands of Anakin Skywalker, in the move that finally pushed him to the Dark Side as he battled Chancellor Palpatine in his high-rise office on Coruscant, He had his hand cut-off, and fell an untold distance to his doom, screaming the whole way down. “In my mind, I’m not dead. Jedis can fall incredibly high distances and not die,” Jackson said in a video message at Star Wars Celebration’s 40th Anniversary panel in April. Will we see the Master Jedi again on the big screen? Only time will tell, but we now know we will see him again. Marvel has taken to StarWars.com to announce a 5-issue mini-series starring Windu for August. 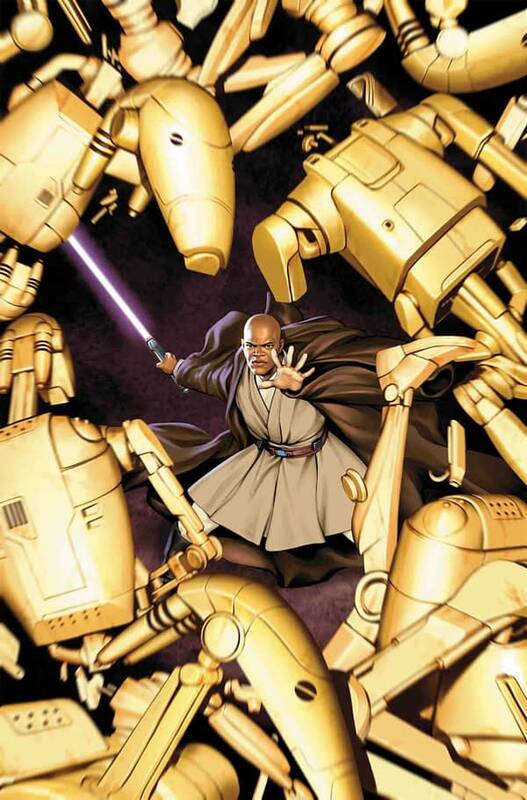 Titled Star Wars: Jedi of the Republic — Mace Windu, it will be written by Matt Owens and illustrated by Denys Cowan, with a cover by Jesus Saiz for issue #1. For over a thousand generations, the Jedi have been the peacekeepers of the galaxy…but now, at the dawn of the Clone Wars, they find themselves in a new role: generals in the Army of the Republic. As Mace Windu, one of the Jedi’s greatest warriors, leads a small unit of Jedi into battle shortly after the war begins, the Jedi must make peace with their new role, or be lost to the violence around them!